It’s slated to be a big year for Coney Island–and not just when it comes to new rides and attractions. A massive development will join the growing redevelopment of the beachfront locale, which will be home to at least four major projects totaling 2,151 units in the coming years. 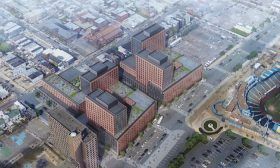 According to CityRealty, Taconic Investment Partners and The Prusik Group are planning to build a ground-up, mixed-use complex tentatively referred to as “Coney Island North Venture.” It’ll be comprised of 1,000 apartments, 80,000 square feet of office space, and 150,000 square feet of retail along Surf Avenue. The complex will join a new 42-story tower, plus a 440-unit development that will boast its very own trolley.